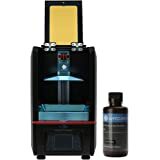 Sold by EXTRIPOD and ships from Amazon Fulfillment. 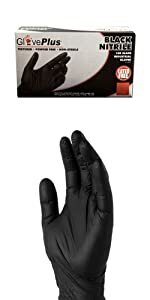 Sold by Superior Glove Works and ships from Amazon Fulfillment. 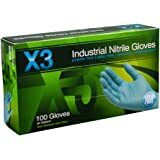 The AMMEX GlovePlus industrial-grade nitrile gloves bring to you several benefits, such as better elasticity than vinyl, better puncture resistance than latex, and better abrasion resistance than chloroprene. 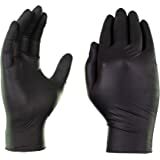 The gloves are designed to provide users with enhanced protection with its 9.5 inches length, and 6 mils finger, 5 mils palm, and 3 mils cuff thickness. 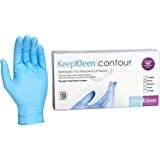 Adding convenience to users, these ambidextrous gloves feature beaded cuff for easy opening, quick donning, and fast removal, as well as a convenient dispense pack that keeps gloves clean and organized while providing easy access. The gloves' micro-roughened texture provides users with enhanced grip, particularly in wet conditions. 100% latex-free, AMMEX GlovePlus gloves are ideal for different types of users, including those who are allergic to natural rubber. 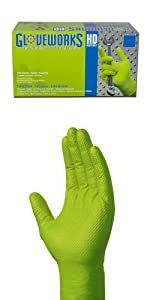 Compliant with FDA regulations (21CFR, 170-199), these powder-free gloves are ideal for food handling and preparation. 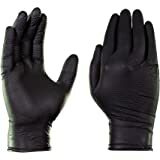 And because they leave no residue, these gloves are also suitable for electronic, forensic, and laboratory applications. 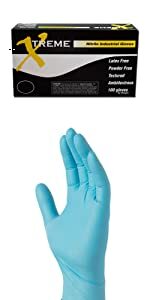 20% thicker than standard Blue Nitrile gloves. Latex-free protection in a great new professional color. Pros aren't afraid to take on the toughest jobs. They expect their gloves to meet the demands of the task. 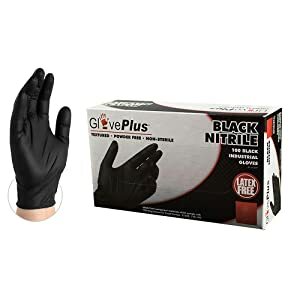 Our black nitrile gloves will get as down and dirty as needed. They are the perfect combination of strength, dexterity, and comfort. 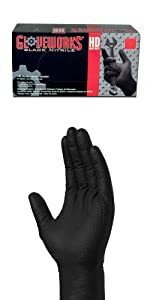 These premium, industrial-grade gloves provide excellent puncture resistance and chemical protection, great fit, and high tactile sensitivity. The black color projects a professional look. Powder-free and latex-free, they come in extended sizes from S-XXL. Sold 100 gloves per box, 10 boxes per case. Disposable Glove Basics: Material, Texture and Thickness. 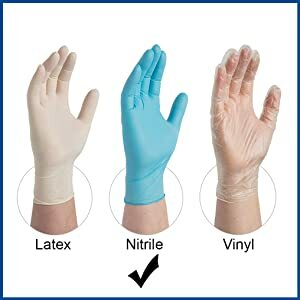 Nitrile is the most highly recommended disposable glove material, with excellent strength, durability, and the fit, feel, and comfort to rival latex. 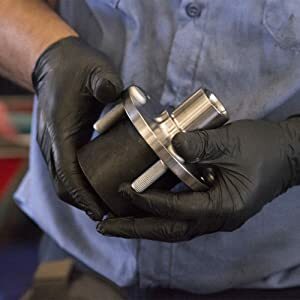 Micro-roughening is standard for nitrile gloves and is a good middle-of-the-road texture that provides a dependable grip across multiple applications. 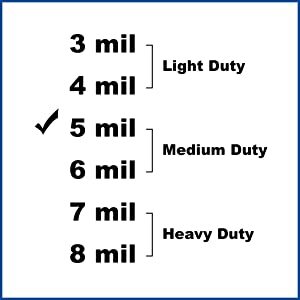 A mil equals one-thousandth of an inch. Gloves with a thickness of 5 to 6 mils are an excellent choice for a wide range of industries and uses. Auto technicians love black nitrile not only for their professional look, but also because they conceal dirt, grease, and grime. 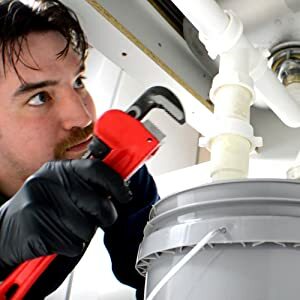 Our black nitrile industrial gloves resist rips, tears, and punctures, plus provide a dependable grip for working with tools—just what plumbers want. 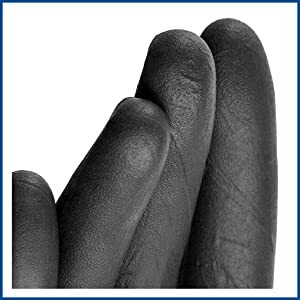 Why should only professionals enjoy the benefits of black nitrile? 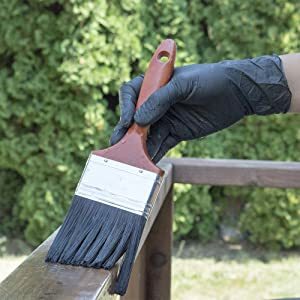 These gloves are great around the house for staining, painting, and lots more. 5.0 out of 5 starsNice thickness, dexterous, but get them a size up. I love nitrile gloves. But I also hate ill-fitting gloves. I've been looking for an affordable pair of durable gloves that fit well (think medical fit) and these were perfect. They come at a much better price than the somewhat comparable Gorilla gloves as well. These are thinner than some other gloves, but with the extra material in the fingers I haven't found tearing to be an issue under normal use. They hold up really well and a single pair will give several hours of use. Despite being powder free they slide on fairly easily. I found that the fit was as expected, so buy the size you would wear in any other glove and you should be fine. Use them all the time, really good quality. No skin irritation or odd smell. Didnt melt together in the hot summer days like he old ones so thats good. Dont bother with sizes- always buy large or extra large, you wont regret it. Wet hands or really dry cold hands dont fit into anything this material easily- let alone trying to take them off. These gloves are definitely best described as light duty use. 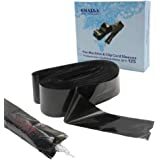 While I've used disposables that tear easier than these do, you can still tear these open fairly easily and I've broken a few putting them on. I will say though, these gloves do fit more loosely than some other gloves I've purchased in an XL size and for what I use these gloves for, I actually prefer that as I tend to use these gloves for oil changes and general cleanup jobs and it makes them easy to get off when I'm done with them, unlike my favorite disposable gloves (Greasemonkey 15ml thickness). 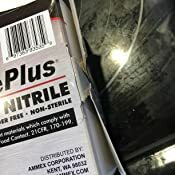 So if you're after gloves for an oil change or cleaning work, these might not be a bad choice, but for general automotive work, look at something else. I use these when cleaning my car to prevent scratching the paint. I also use them for cleaning the house or carrying tires around. The 5 mil thickness is a lot thicker than the traditional 3-4 mil gloves I use. Those gloves while cheaper, broke a few times for me in the past. 5 mil gives me the confidence that it won't break easily. The non-latex material helps keep my hands feeling nice and itch free. 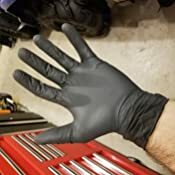 I picked up these gloves because I wanted to get a set of nitrile gloves for working in my shop. 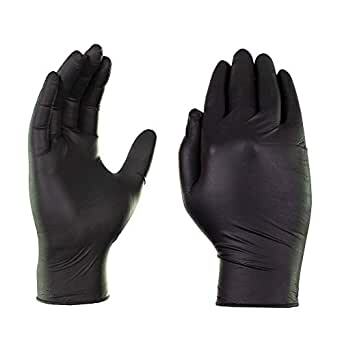 These gloves are great for dexterity and protection from oils and basic physical abuse. They are not designed for any sharp objects so don't even think about using them to replace your leather gloves when using your grinding wheel. 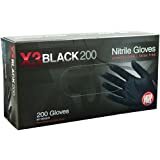 But these gloves are great when working on your car or truck doing an oil change or anything similar in task. 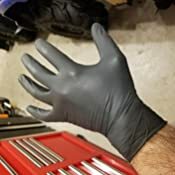 This black set of nitrile glove stays in my shop and the blue set stays inside my house. I found that the black gloves are thicker than the blue gloves slightly, which I like especially when I'm working in my shop. 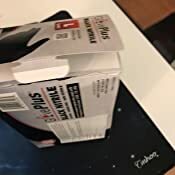 Four stars, because the gloves do tend to stick together as your pulling a pair out of the box. That being said, they don't tear, and when I'm cleaning the litter box it's nice to have these between me and the "nasty" part of pet ownership. I have very small, slender hands and I needed a glove that fit... well, like a glove. These fit nicely without too much extra space allowing me to maintain dexterity sufficient grip fir my work. 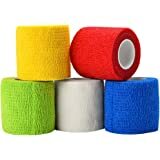 They appear to be made of excellent and durable material that won't tear easily. 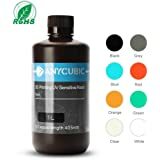 I am satisfied with this product and would repurchase in the future.